The mission of Lions SEE, Inc. (Screening Eyes Early) is to decrease childhood blindness through early detection and treatment of the most common vision disorders that cause Amblyopia; insuring that all children of New York State will be able to SEE their future. Lions SEE is a free vision screening program run by Lions from accross New York State to help identify pre-school children (Ages 1 to 5) with or at risk for amblyopia "Lazy Eye". The program is offered by the Middletown Lions Clubs in collaboration with the Lions SEE Program at the Ira G. Ross Eye Institute. The Middletown Lions Club screened 448 preschoolers during the school year 2013-2014. There were 74 referrals for examinations by an ophthalmologist. Amblyopia is poor vision in an eye that did not develop normal sight during early childhood. It is sometimes called "lazy eye. "When one eye develops good vision while the other does not, the eye with poorer vision is called amblyopic. Usually, only one eye is affected by amblyopia, but it is possible for both eyes to be "lazy. "The condition is common, affecting approximately two or three out of every 100 people. The best time to correct amblyopia is during infancy or early childhood. 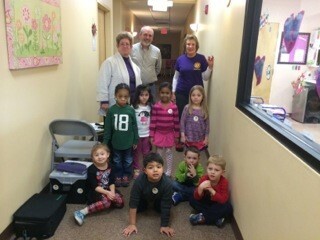 Pre-schoolers were screened recently by Lion Joan Stoltz, and Past President of the Club Marlinda Duncanson and Past District Governor Clifford Youngs. Literacy -- the ability to read and write -- is the foundation for education and social development. Yet, hundreds of millions of adults lack minimum literacy skills and millions of school-aged children are not attending school to obtain them. The Reading Action Program is a 10-year commitment to increasing reading and literacy rates. It’s a call to action for every Lions club around the world to organize service projects and activities that underscore the importance of reading and address specific needs related to illiteracy within their own community. 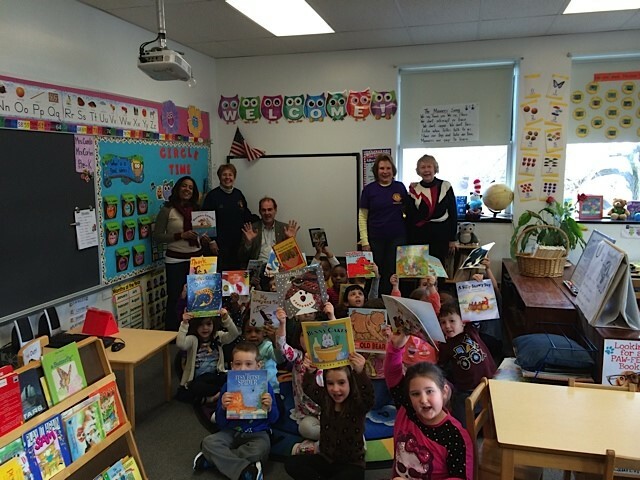 The Middletown Lions Club has already taken great strides to bridge the gaps in literacy and education while addressing the need for healthy vision. They read to 722 pre-school children in the area during the 2013-2014 school year and gave each student their very own book provided by a matching grant from the Brandel-Murphy Youth Foundation. Many children are living in homes where there are no books available. Some of these children's parents cannot read themselves so cannot read to their children which studies have proven is a very important part of child development. 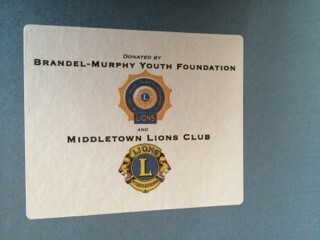 The Middletown Lions also arrange for free eye exams for qualifying parents and their children. Reading aloud to young children is one the most effective ways to prepare children to succeed in school. However, many children, particularly those living in poverty, are not exposed to books and reading until they begin attending school. Research shows that books contain many words that children are unlikely to encounter frequently in spoken language. Children's books actually contain 50% more rare words than primetime television or even college students’ conversations. Many thanks to the Brandel-Murphy Youth Foundation for giving our club a matching grant to purchase books for the preschoolers in our area. A group of Lions read to students and gave each one their own book! Middletown Lions Club Peace Poster Contest Winner 2013-2014 was 13 year old Noe Cardozo Huerta who attends Monhagen Middle School. Noe recieved a certificate and a check for $50.00 from then President Debi Yuhas-Shembeda. The theme was "Our World, Our Future." Each year, Lions clubs around the world proudly sponsor the Lions International Peace Poster Contest in local schools and youth groups. The art contest for kids encourages young people worldwide to express their visions of peace. For more than 25 years, millions of children from nearly 100 countries have participated in this contest. The theme of the 2014-2015 Peace Poster Contest is "Peace, Love and Understanding." Students ages 11, 12 or 13 on November 15th are eligible to participate. Each poster is judged on originality, artistic merit and expression of the theme. Posters advance through several judging levels: local, district, multiple district and international. At the international level, judges from the art, peace, youth, education and media communities select one grand prize winner and 23 merit award winners. One international grand prize winner will receive US$5000.00 and a trip to a special award ceremony. Our first Fishing Derby with the Town opf Wallkill was held at the Circleville Park on Saturday, June 21, 2014. It was a great success. Over 70 children and their parents participated. The June 14, 2014 awards ceremony at the Annual Middletown Lions Club and Dept. of Parks & Recreation's Fishing Derby held on the Saturday before Father's Day every year. This is the Middletown Lions Club's Picnic Pavilion at Fancher-Davidge Park that our club donated. The aerator in background on the left was also donated by our Lions club to help keep Summit Pond clean and healthy for fish. Working with the City of Middletown's Dept. of Parks & Recreation, our club also helps restock fish in the pond for everyone who enjoys fishing there. The Middletown Lions Club is always busy collecting food items for R.E.C.A.P. 's food pantry. Here, Lions collect donated food items from patrons of Garcia's Market on North Street. The Middletown Lions Club continues to provide free eye exams and eye glasses for children and adults who qualify. Sight preservation is the Lions Clubs International's main focus. Helen Keller challenged Lions to be "Knights of the Blind." Please contact us if you have a need for our services and we will work with you to see if you qualify. The Middletown Lions Club works with individuals who have hearing disabilities by providing free audio exams and hearing assistive devices for those who qualify. Please contact us if you have a need. The Middletown Lions Club collects used eyeglasses and hearing aids each month from 33 collection boxes placed in businesses and public buildings in the City of Middletown and the Town of Wallkill. We collect an average of 200 eyeglasses a month. Together with other Lions Clubs in Orange County, the used eyeglasses are transported to the Lions Eye Bank In Albany by volunteers. The eyeglasses are then cleaned, counted and sorted by people working in a sheltered workshop. The eyeglasses are then boxed and mailed to the Lions Eyeglass Recycling Center in Indiana. There the prescriptions of the eyeglasses are calibrated for distribution to people with vision problems in under developed countries through missions. Orange County Trust Wilson Field Dolson Ave. Greater Upper Room Apostolic Church Linden Ave. Ultimate Unisex Salon East Main St. Working with the Middletown Cares Coalition, the Middletown Lions Club adopts a family and provides food for a holiday meal as well as gifts for each member of the family.